Join women every Monday night at 7 PM in Colonial Chapel for this powerful in-depth teaching! Written by Pastor Connie Weisel, the Walls of Our Heart book is a transcription of a teaching by the same name. It teaches us how to recognize the walls we have built around ourselves to protect us from the pain of hurts, and then shows us how to use God's word to tear down those walls so He can reach through to heal us. This teaching has changed thousands of lives, and we want you to have it! 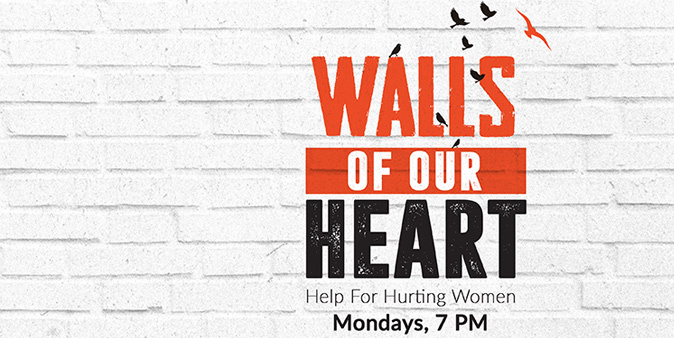 In addition to the Walls of Our Heart teaching women can attend on Monday nights at 7 PM, everyone is invited to join Pastor Connie every week for the Help for Hurting Women TV program on our local Christian station, CTN10. The show airs at 2:30 AM on Mondays and at 10 AM on Wednesdays.